Halophytes are salt-tolerant plants that grow in waters with high salinity, such as in mangrove swamps, marshes, seashores and saline semi-deserts. Only two per cent of the plant species found on the Earth are halophytes. As they are able to tolerate high salinity through different adaptation methods like tolerance, resistance and avoidance, they have less competition in saline environments. Halophytes are classified into aqua-halines, terrestro-halines and aero-halines. Aqua-halines include Emerged Halophytes, among which most of the stem remains above the water level and Hydro-halophytes, among which almost the whole plant remains under water. Terrestro-halines include Hygro-halophytes, which grow on swamp lands, Meso-halophytes, which grow on non-swamp and non-dry lands and Xero-halophytes, which grow on dry or mostly dry lands. Aero-halines include Oligo-halophytes, which grow in soil with NaCl (Sodium Chloride) from 0.01 to 0.1 per cent; Meso-halophytes, which grow in soil with NaCl from 0.1 to 1 per cent and Euhalophytes, which grow in soil with NaCl greater than one per cent. In the state of Tamil Nadu, where I come from, halophytes are found growing in waters with high salinity along the seashore in Pichavaram in North Tamil Nadu as well as the Point Calimere Wildlife and Bird Sanctuary and Gulf of Mannar Biosphere Reserve along the Palk Strait in the southern part of the state. These are the associates of the true mangrove plants. Some of the mangrove associates that grow abundantly in the Point Calimere Wildlife and Bird Sanctuary and Muthupet areas include Suaeda monoica, Suaeda maritima, Suaeda nudiflora, Arthrocnemum macrostachyum, Tecticornia indica, Salicornia brachiate and Sesuvium portulacastrum. Out of these halophytes, plants belonging to the Suaeda genus have been growing in large numbers. They are herbaceous plants growing to a height of 1 to 2 metres. Suaeda maritima has red streaks on the main stem, which is missing in Suaeda monica. The Suaeda and Salicornia varieties do not compete with each other. Unlike other plants, those of the Sesuvium genus grow by spreading on the floor. Their stems and leaves are red in colour. Halophytes are generally colonisers and grow in areas which are subjected to periodic inundation. Suaeda monica is the only halophyte which is observed growing more gregariously in degraded areas when compared with other halophytes. 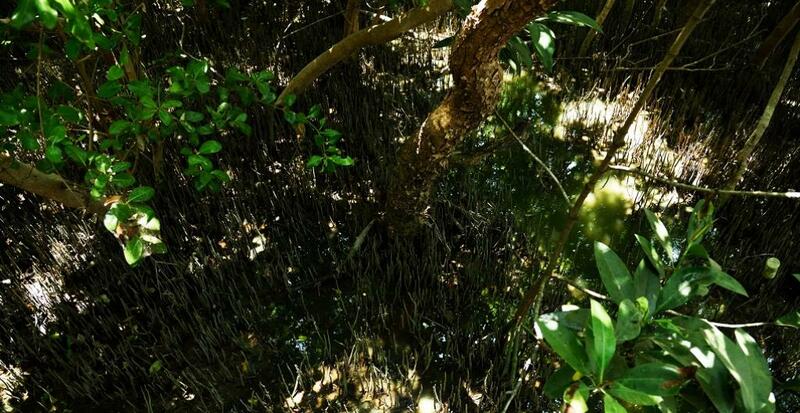 As halophytes are salt extractors, they perform the key function of reducing soil salinity and making the area more suitable for growing mangrove species. Over a period of time, in the course of ecological succession, halophytes are gradually replaced by mangrove species, which grow vigorously and get established. If not for the presence of halophytes, the regeneration of mangroves would be very difficult in seashore areas which face frequent seawater ingress. Seawater generally contains 40 grams of dissolved NaCl per litre. Beans and rice can grow in water containing about 1-3 grams of NaCl/ litre. Barley and Date Palm can grow in water with 5 grams of NaCl/ litre. Though these plants have more salt content, parts of them are used for human consumption and as cattle feed. Halophytes that grow in desert regions, estuaries where rivers join the sea and along the seashore, are used for human consumption, cattle feed and for biofuel production. In Point Calimere, the succulent leaves of Suaeda monoica are relished by black bucks while in Somalia and Kenya, it is browsed by camels and goats. It is said that during famine, the leaves of Suaeda monoica were boiled and eaten by the people of this region. Edible oil is extracted from the Salicornia species. The salt absorbed through its roots is evaporated through the minute pores of the leaves of the halophytes. Generally, halophytes will have very small leaves. When there is scarcity of water, they shed them. These plants are bestowed with long roots that help in the search for fresh water. When the leaves are absent, photosynthesis will take place through the stems. Some of the halophytes grow on top of hills situated near seashores and on sand dunes. They are capable of thriving even in semi-desert regions with scanty saline water. The succulent leaves help the halophytes for storing water in these kind of adverse conditions. Halophytic flora plays a major role in protecting coastal habitats and maintaining ecological stability. They often creep and act as sand dune binders. They prevent erosion to a great extent and seawater incursion into freshwater habitats. Halophytes provide food and shelter for a large number of aquatic and terrestrial animal species. Researchers have identified some halophytes which have the potential of yielding sustainable supply of renewable resources like food, fodder, fibre, fuel, green manure and raw materials for pharmaceutical, industrial and household products. Studies have shown that many halophytes can be used as sources of nutritious grain and oil, while some bear edible or economically-useful roots, bark, stems, leaves, flowers, fruit and seeds. Certain halophytes are able to accumulate and transform toxic levels of heavy metals (lead, cadmium and selenium) into organic compounds. Salicornia cultivation is considered to be economically profitable since it is harvested as selenium-rich animal feed because of its ability to convert high concentrations of inorganic selenate into organic selenium. Salicornia plantation has been initiated in Mexico as it plays a key role in carbon sequestration. The commercial viability of halophytes is determined by screening relevant properties such as salt tolerance, nutritional value, palatability and digestibility. Halophytes are assessed to have potential as biomass crops to directly sequester up to 0.7 Gt C. Thus, halophytes, like trees, can play a significant role in mitigating climate change. In reality, many of the frontline field staff of forest departments in India are not able to identify these valuable halophytes. The ecological values of the halophytes are not known to many. So far, no tangible action has been initiated to propagate and protect halophytes by any government agency. Since halophytes play an important role in helping the establishment of mangroves which in turn protect the interior from tsunamis, cyclones and storms, it is very essential to propagate and protect them. It is high time that the Central and state governments make some serious efforts to identify, propagate and protect the most useful halophytes.